For distinctive decor, the finishing touches matter most. Our silver Mercury Candles make the difference in creating an elegant look, with silver metallic surfaces created to mimic those used in classic mercury glass objects. Non scented. Sold separately. 2.0 Out of 5 Average Rating | 33% of reviews would recommend this product. [value] => I love the look of these candles. However, the wick of the candle is too wimpy for its size. I have bought 3 or 4 of these, and when you get half way thru the candle, the wick completely disappears. You are stuck with 5-6 inches of candle that can't burn simply due to the fact that the wick is missing. [value] => Color of candle came off on paper (saran) around it. [value] => Ordered tapers but they appear much more gold in person. Luckily, they still work for me. [value] => Ordered tapers and appear much more gold in person. Luckily they still work for me. 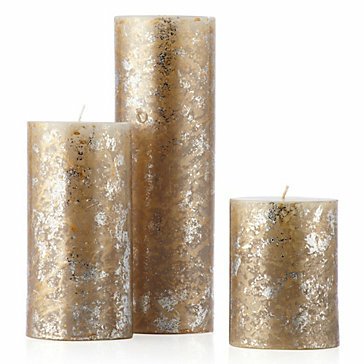 I love the look of these candles. However, the wick of the candle is too wimpy for its size. I have bought 3 or 4 of these, and when you get half way thru the candle, the wick completely disappears. You are stuck with 5-6 inches of candle that can't burn simply due to the fact that the wick is missing. Color of candle came off on paper (saran) around it. Ordered tapers but they appear much more gold in person. Luckily, they still work for me. Ordered tapers and appear much more gold in person. Luckily they still work for me.